In September of each year Palestinians recall the egregious massacres committed against them in Lebanon in 1982 which claimed the lives of thousands of civilians. In his testimony, published by the US "Nation Magazine", the Palestinian historian, Rashid Khalidi, shed light on Washington's involvement in the massacres. The report noted that the US had a prior knowledge of what the Israeli troops intended to do, adding that when the US special envoy, Morris Draper, met the Israeli criminal who led the operations, Ariel Sharon, the latter told him that he would kill everyone and that no-one would be left to live. The US responsibility is not just a matter of having a prior knowledge or supplying the Israeli forces with lethal weapons, according to Khalidi who affirmed that the massacres started after US gave the green light for the onslaught. It was the US, through its foreign ministry, who pushed Palestinians, represented by the Palestine Liberation Organization (PLO), for ceasefire talks and made guarantees for their safety. 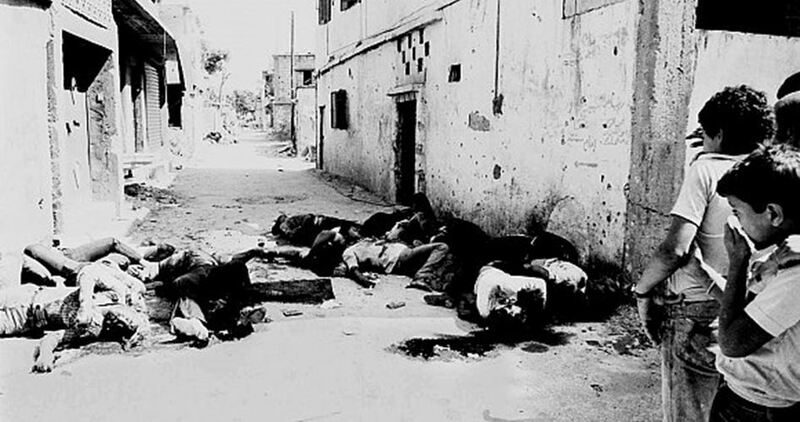 Sabra and Shatila massacres took place less than a month after that. An official memo sent by the US administration on 5th August 1982 to the Lebanese government and the PLO said, "Law-abiding Palestinian non-combatants remaining in Beirut will be authorized to live in peace and security. The Lebanese and US governments will provide appropriate security guarantees." The report was concluded by saying that the US continues to this day to offer blind support for the Israeli occupation costing the lives of tens of thousands of Palestinians. Thirty-Five years ago as Israel overran West Beirut, Lebanese Christian militiamen entered the Palestinian refugee camps of Sabra and Shatila in West Beirut. Over three days, Israeli forces sealed the camp and allowed them to slaughter several thousand refugees. I was then a young orthopedic trainee who had resigned from St. Thomas Hospital in London to join a Christian Aid medical team helping those wounded during Israel’s invasion of Lebanon a few months earlier. Beirut was under siege. Water, food, electricity and medicines were blockaded. The invasion left thousands dead and wounded, and made an estimated 100,000 people homeless. I was seconded to the Palestine Red Crescent Society to take charge of the orthopedic department in Gaza Hospital in the Sabra and Shatila camp in West Beirut. I met Palestinian refugees in their bombed out homes and learned how they became refugees in one of the 12 Palestinian camps in Lebanon. Until then I did not know Palestinians existed. They recalled how they were driven out of their homes in Palestine in 1948, often at gunpoint. They fled with whatever possessions they could carry and found themselves in neighboring Lebanon, Jordan and Syria. The United Nations put them in tents while the world promised they would return home soon. That expectation never materialised. This is their 69th year living as refugees. Palestine was erased from the map of the world. The 750,000 refugees, comprising half of the population of Palestine in 1948, have grown to 5 million. Soon after my arrival in Beirut, Yasser Arafat’s Palestine Liberation Organization (PLO) left the city. It was the price demanded by Israel to stop further bombardment of Lebanon and to lift the 10-week military blockade. Fourteen thousand men and women left Lebanon after a guarantee by western powers that their families who were left behind would be protected by a multinational peacekeeping force. Those leaving were fighters, civil servants, doctors, nurses, lecturers, unionists, journalists, engineers and technicians. The PLO was the Palestinians’ government in exile, and the largest employer. Thousands of Palestinian families, many of whom had lost members in the invasion, now were without their breadwinner, often the father or the eldest brother in the family. The cease-fire lasted only three weeks. The multinational peacekeeping force, entrusted by the cease-fire agreement to protect civilians, abruptly withdrew. Shortly after, Lebanon’s newly installed Christian president, Bashir Gemayel, was assassinated. Then, on September 15, several hundred Israeli tanks drove into West Beirut. Some of them ringed and sealed Sabra and Shatila, preventing the inhabitants from fleeing. A group of Christian militiamen, trained and armed by Israel, entered the camp. When the tanks withdrew from the perimeter of the camp on September 18, several thousand civilians were found dead inside the camp, while others had been abducted and disappeared. Our hospital team, who had worked nonstop for 72 hours, was ordered to leave our patients at machine-gun point, and marched out of the camp on September 18 . As I emerged from the basement operating theater, I learned the painful truth. While we were struggling to save a few dozen lives, people were butchered by the thousands. Some of the bodies were already rotting in the hot Beirut sun. The images of the massacre were deeply seared into my memory. They included dead and mutilated bodies lining the camp alleys. Only a few days before, they were human beings full of hope and life, trusting that they would be left in peace to raise their children after the evacuation of the PLO. These were people who welcomed me into their broken homes. They served me Arabic coffee and whatever food they found, simple fare but given with warmth and generosity. They shared with me their broken lives. They showed me faded photographs of their homes and families in Palestine before 1948 and the large house keys they still kept with them. The women shared with me their beautiful embroidery, each with motifs of the villages they left behind. Many of these villages were destroyed after they left. During the massacre, some of these people became patients we failed to save. Others died on arrival. They left behind orphans and widows. A wounded mother begged us take down the hospital’s last unit of blood from her to give to her child. She died shortly afterwards. Children who witnessed their mothers and sisters being raped and killed would always bear the trauma. The terrified faces of families rounded up by gunmen while awaiting death; the desperate young mother who tried to give me her baby to take to safety; the stench of decaying bodies as mass graves were uncovered; the piercing cries of women who discovered the remains of their loved ones from bits of clothes and refugee identity cards – these memories will never leave me. The survivors returned to live in the very homes where their families and neighbors were massacred. They are a courageous people, and there was nowhere else to go. Today, Palestinian refugees in Lebanon are barred from 30 syndicated professions, and only 2 percent of Palestinians in nonprofessional jobs have proper work permits. They do not have passports. They are prohibited from owning and inheriting properties. Denied the right of return to their homes in Palestine, they are not only born refugees, they will grow up as refugees and die refugees. As for me, I still have painful questions that need to be answered. Why were they massacred? Has the world forgotten the survivors? How can we allow a situation where a person’s only claim to humanity is a refugee identity card? These questions have haunted me since I first met the Palestinian refugees of Sabra and Shatila. I have yet to receive an answer. This article was first published by Refugees Deeply. - Dr. Swee Chai Ang is a consultant orthopedic surgeon at St. Bartholomew’s and the Royal London hospitals and co-founder of Medical Aid for Palestinians. Born in Malaysia and raised in Singapore, she came to the UK as a refugee. She is the author of,“From Beirut to Jerusalem: A Woman Surgeon With the Palestinians” published by The Other Press. PLO Executive Committee Member Dr. Hanan Ashrawi made a press release, today, addressing the memory of the Sabra and Shatila massacre which occurred 35 years ago, and where some 3,000 Palestinians were murdered. Ashrawi said, according to the PNN, “Today we somberly mark the thirty-fifth anniversary of the massacre of innocent Palestinian civilians in the Sabra and Shatila refugee camps, in west Beirut, that took place between September 15-18, 1982, with the collusion and support of the Israeli army under Ariel Sharon who left a legacy of bloodshed and destruction. This massacre claimed the lives of 3,000 Palestinian refugees. “This remains a tragic chapter in Palestinian history, and thirty-five years later, the Sabra and Shatila massacre still represents Israel’s cruelty and inhumanity towards the Palestinian people as a whole. This massacre, as well as other massacres against the Palestinian people, go unpunished. Dr. Saeb Erekat also stressed the importance of resolving the issue of Palestinian refugees in a press release about Sabra and Shatila massacre. He said, “The memory of the brutal Sabra and Shatila massacre still resonates in our minds and hearts. It is embedded in every Palestinian memory and soul. Thirty-five years ago, the vicinity of the two refugee camps in Beirut was filled with the scent of death and bodies of thousands of butchered and injured Palestinian children, women and men. A criminal act engineered by Ariel Sharon, Israel’s Military General at the time, who facilitated the barbaric butchering of defenseless refugees by Phalangist forces under his watch. Today is a reminder to the world of a criminal who escaped justice and got away with it. “Sabra and Shatila massacre will not be wiped off from our conscious. It is a reminder of the more than 400 Palestinian villages destroyed by Zionist paramilitaries and of the Palestinian exodus who were uprooted and forced out their homes. It is also a reminder of the absence of justice and accountability. Sharon and the Israeli leaders who masterminded this massacre should have been tried in international courts. Instead, Sharon was awarded to become Israel’s tenth prime minister. 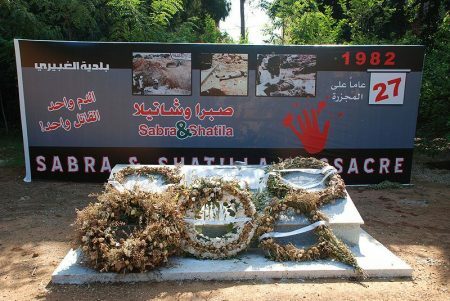 Saturday, 16 September 2017, marks the 35th anniversary of the massacre of Sabra and Shatila in the Sabra and Shatila refugee camps in Lebanon in 1982. On that day, the world woke up to what seemed to an irreparable wound for the Palestinians. The world woke up to one of the most heinous massacres in the history of mankind against the Palestinians, to slaughtered bodies without heads, eyeless heads, and broken bones. The massacre against the people of the two camps continued for three days, from 16 to 18 September, during which many martyrs, including men, children, women and elderly unarmed civilians, mostly Palestinians, were murdered. 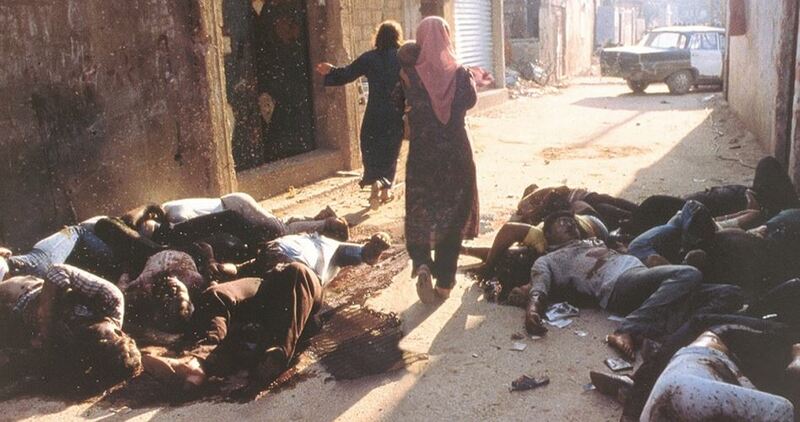 Three thousand martyrs were murdered of the 20,000 inhabitants of Sabra and Shatila at the time of the massacre. The massacre began after the Israeli army, led by the then Minister of Defense Ariel Sharon and his chief of staff Rafael Eitan, surrounded the refugee camps, and facilitated entry of Lebanese Christian militias to commit the massacre with complete media blackout. They used knives and other weapons in the killings. The Israeli army besieged the camp and lit it at night to facilitate the bloodbath. Only children, elderly and women were in the besieged camps. The Lebanese gunmen killed women and children in cold-blood. Most of the bodies were strewn in the streets of the camp and then bulldozers entered the camp to demolish the houses and hide the crime. 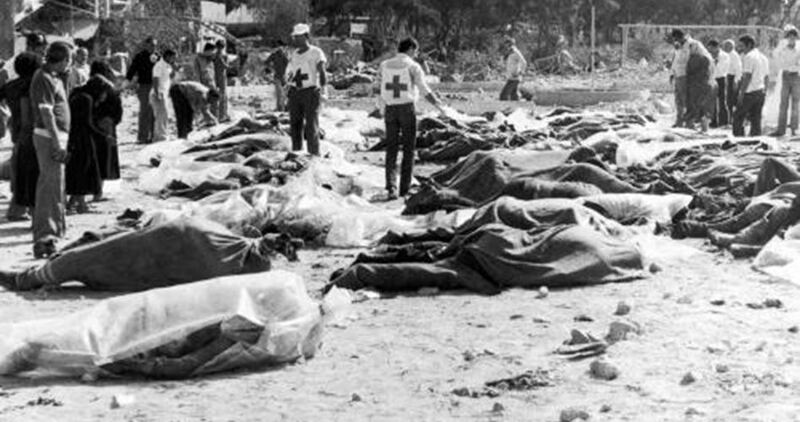 The massacre was carried out in revenge from the Palestinians who stood up to the Israeli war machine following three months of siege, which ended with international guarantees to protect the unarmed inhabitants of the camps after the Palestinian resistance fighters left Beirut, but the broker states did not fulfill their obligations and abandoned the innocent people of the camps, leaving them to be killed or wounded. 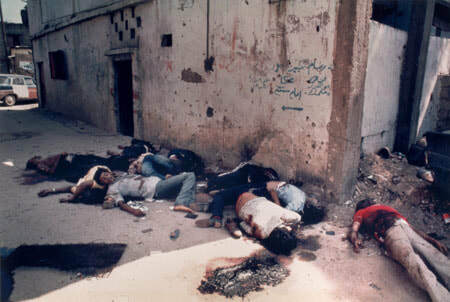 The massacre aimed at spreading terror in the hearts of the Palestinians, urging them to migrate outside Lebanon, fueling internal strife there, and completing the 1982 Israeli invasion of Lebanon, which targeted the Palestinian presence there, and to incite the Palestinians against their leadership at the pretext that they left Lebanon and left them without protection. The carnage in Sabra and Shatila was not the first Israeli massacre against the Palestinian people, and it was not the last. It was preceded by the massacres of Qubiya, Deir Yassin and Al-Tantura, and followed by the Jenin and the Gaza massacres, and other massacres. Despite the big number of deaths and the way civilians were murdered, the perpetrators are still at large. Sabra is an administrative district of Al-Ghubairi municipality in the governorate of Mount Lebanon, bordered by the city of Beirut to the north, the sports city to the west, the tombs of martyrs and Qusqas from the east, and Shatila camp from the south. The Sabra neighborhood is home to a large number of Palestinians, but it is not a refugee camp officially, although its name is associated with Shatila, which creates the impression that it is a camp. The name belongs to the family of Sabra, which the street that passes through the heart of the neighborhood was named after, starting from the neighborhood of Dana in the New Road of Beirut and passing through the Sabra square and the main vegetable market, and ending at the entrance of Shatila camp. Shatila is a Palestinian refugee camp established by the United Nations Relief and Works Agency for Palestine Refugees in the Near East (UNRWA) in 1949 to house hundreds of refugees who poured into it from the villages of Amqa, Majd Al-Krum and Yajour in northern Palestine after 1948. The camp is located to the south of Beirut, the capital of Lebanon. Months after the Nakba, and as the demand for housing increased, Saad Eddin Pasha Shatila donated a land to build a refugee camp on it, which became known since then as the Shatila camp. Half of the land of the camp belongs to the Palestine Liberation Organization while UNRWA rents the other half. The camp is known to be the site of the Sabra and Shatila massacre in September 1982, in addition to the 1982 Lebanese Civil War and the Camps War between 1985 and 1987. The area is one square kilometer and is home for more than 12,000 refugees. The camp is one of the most densely populated areas with only two schools and one medical center. The environmental health of the camp suffers from severe shortages; houses are damp and overcrowded, many have open drains, and the camp’s drainage system needs to be expanded. 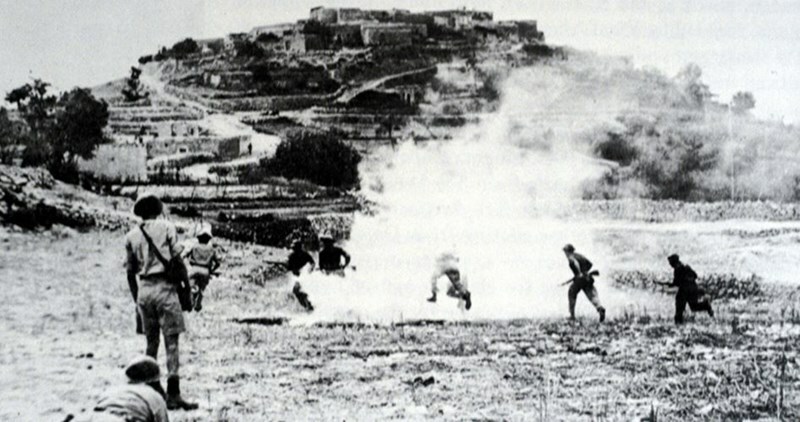 The decision to commit the massacre was made by Rafael Eitan, the Chief of Staff of the Israeli army, and Ariel Sharon, then the Minister of Defense in Menachem Begin’s government, during which the occupation army allied with the Lebanese Phalange Party to write a bloody page of injustice and oppression in its history. On the morning of September 16, 1982, the refugees of Sabra and Shatila camps woke up to one of the bloodiest chapters in the history of the Palestinian people, and maybe to one of the ugliest massacre in the history of the entire world against resistance and liberation movements. Three armed groups, each consisting of 50 armed men, entered the camp. The Lebanese Maronite groups surrounded the inhabitants of the camp, killing civilians relentlessly. The camp was completely encircled by the South Lebanon Army and the Israeli army. The Lebanese militias committed the massacre inside the camps while the Israeli army provided protection and ordered civilians who tried to leave the camps to go back. Dozens of Palestinians, including Israeli and international peace activists, conducted the weekly nonviolent protest in Ni’lin village, west of the central West Bank city of Ramallah, marking the 35th anniversary of Sabra and Shatila Massacre. 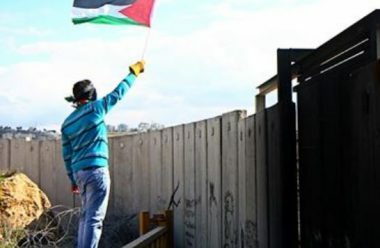 The nonviolent protesters marched towards illegally confiscated Palestinians lands, which Israeli took over for the construction of the Annexation Wall, in the southern part of the village. They carried Palestinian flags and chanted for national unity, and for holding Israel accountable for its crimes and escalating violations. Mohammad Amira, a member of the local Popular Committee against the Annexation Wall and Colonies, thanked all Israeli and international peace activists who participate in the ongoing Palestinian struggle for justice, liberty and independence. Amira also called on the international community to ensure the Palestinians receive the urgently needed protection, and also called for stepping-up the efforts to pressure Israel into ending its crimes, its occupations and its dangerously-escalating illegal colonialist activities. “Thirty-four years ago an Israeli general, Ariel Sharon, violated an Israeli obligation not to enter West Beirut and facilitated the barbaric massacre of hundreds of Palestinian refugees that were under his control,” said Erekat in a statement published on Friday. Erekat said, according to WAFA correspondence, that Israel was accepted as a United Nations member under the commitment to honor partition of Palestine resolution 181 and right of return of refugees resolution 194, as well as the UN Charter. However, “to date, the international community has failed to honor Palestinian rights, let alone to hold Israel accountable for its violations and crimes against the land and people of Palestine,” he said. “Sabra and Shatila is a reminder of the importance to make justice prevail over impunity,” concluded the PLO official. Hamas Movement affirmed that Sabra and Shatila massacre will never be forgotten especially as the Israeli enemy is not prosecuted for its crimes yet. On the 34th anniversary of Sabra and Shatila massacre, Hamas Office of Refugee Affairs called in a statement issued Friday for the prosecution of the perpetrators of that massacre at the International Criminal Court. The criminals have no place but prisons, the statement said. The statement also called for maintaining stability and security in the Palestinian refugee camps in Lebanon. Sabra and Shatila massacre took place starting on September 16, 1982, after the Israeli occupation army, led back then by Ariel Sharon, surrounded the refugee camp after invading Beirut, and granted access to the Lebanese Phalange militias to enter the camp to slaughter its refugees. The massacre lasted for three days (16, 17 and 18 of September 1982), approximately 3,500 persons, including children, infants, women and elderly were slaughtered and murdered in this horrific and gruesome massacre perpetrated by the Israeli army and its allied criminal militia.